One of the ways we’ve saved a little money is that my wife now cleans my work shirts. I still work in one of the remaining few offices where you’re expected to wear a button down shirt and tie (Friday’s are more casual). Before my wife left her job to be a stay-at-home-mom, we would take my dress shirts in to the dry cleaner to get laundered and pressed. She’s started doing it, and for the most part it works out well. It is time consuming, mainly the ironing, but she’ll usually reserve a couple of hours and combine it with other ironing to get it all done every few weeks. And, the savings have been noticeable! One thing we’ve noticed a couple of times is that there appear to be stains on the shirts. I generally don’t stain my shirts at work and don’t come into contact with anything that would explain this, so it was puzzling. In most cases, re-washing it with a little degreaser seemed to do the trick. Still, it was annoying. I did a little research and I guess this is somewhat of a common occurrence, and can be blamed on one or both of the following: Dryer sheets and Fabric softener. Apparently, both of these contain some oils that can actually cause grease stains on materials which contain polyester. Most of my shirts are made of a blend of mostly cotton but a slight infusion of polyester to assist with the wrinkling, so it kind of started to fit together. I guess with high efficiency washing machines (front loaders), it’s easy to use too much fabric softener, which is something that my wife adds to just about every load of our clothes. 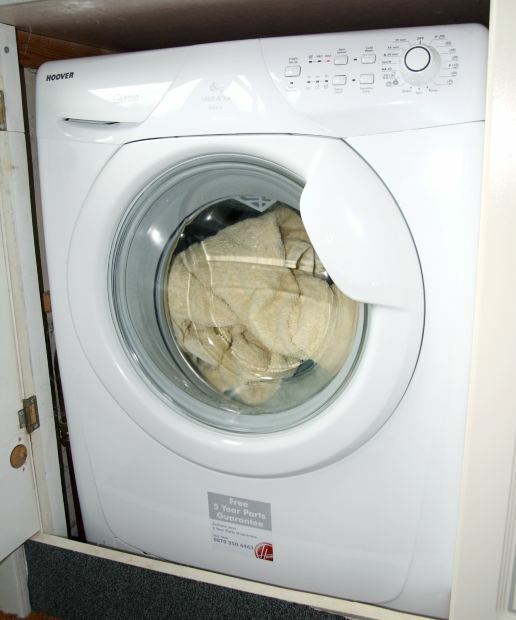 Even though the stuff we buy is made for such machines, and even though we add what the machine reservoir indicates is a good amount, it may still be too much, and then running it through the dryer cycle with a dryer sheet, which also contains some oils, can be overload. So, from now on, we’ll be using less fabric softener in every load, and hopefully that will eliminate the random occurrences of stains on my shirts. Use less fabric softener than is called for. Cut the recommended amount down by half and monitor. You’ll find a point where your clothes are still soft but you eliminate the stains. Clean your fabric softener line. One thing that didn’t apply to us, but I saw was a problem, is if your fabric softener area gets gunked up. At this point, you could have clumps that would enter the machine during a wash cycle and oversaturate particular areas with fabric softener. 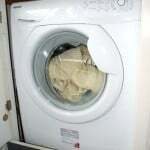 Use dryer sheets carefully or eliminate them altogether. For smaller loads, use half a sheet. Consider phasing out dryer sheets and replacing it with a dryer ball, which does not contain the oils that plague dryer sheets. Place your dryer sheets on top of the load before starting the dryer. Placing the sheet in your dryer after your clothes are put in will reduce the likelihood that the sheet will remain stuck to one item. This happened to us on our duvet cover, and after the dryer finished running, we had a spot the exact size of a dryer sheet from where it had gotten stuck. Washing and drying clothes has sure gotten a lot easier than the ‘old days’ of wash tubs and drain boards, but there’s still a lot that you have to know in order to make sure that your clothes last and remain wearable for as long as possible. We'd read in the newspaper that vinegar was a great fabric softener. We tried it by putting it in the fabric softener spot. Our fabrics have never been softer. Never use the stuff. As far as I can tell, fabric softener is one of those artificial needs advertising companies sold to our mothers thirty years ago, and that we continue to use because "that's how Mom always did it." It is expensive and add one more unnecessary chemical to the environment. Fabric softener + dryer sheets is just mind blowing to me – twice the money spent and chemicals going into the environment, for no benefit that I have ever been able to ascertain. My friend and I started a laundry service from our homes a few years ago. We found a little tip that we use on every load now. White vinegar. Add 3/4 cup into the rinse cycle and it acts as a natural fabric softener, saves money, is eco-friendly, prevents fading and helps keep your washing machine clean.